Greece is an overwhelmingly Orthodox Christian country. There are large cathedrals in the major cities of Athens and Thessaloniki, and little chapels all over. 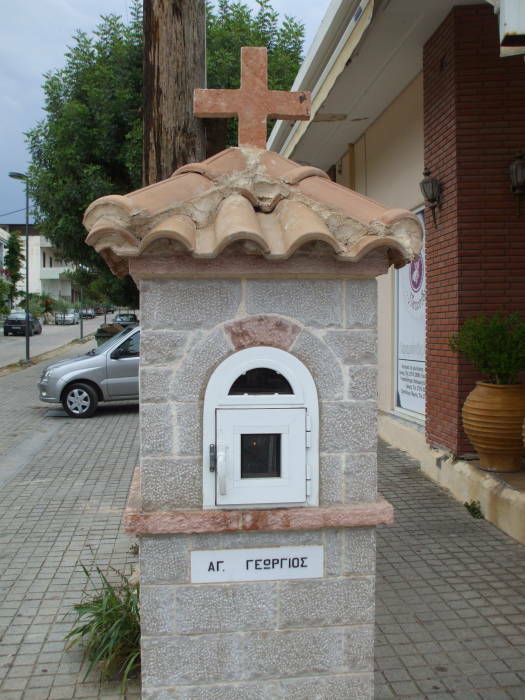 Several Greek islands proudly announce having 365 chapels, one for each day of the year. 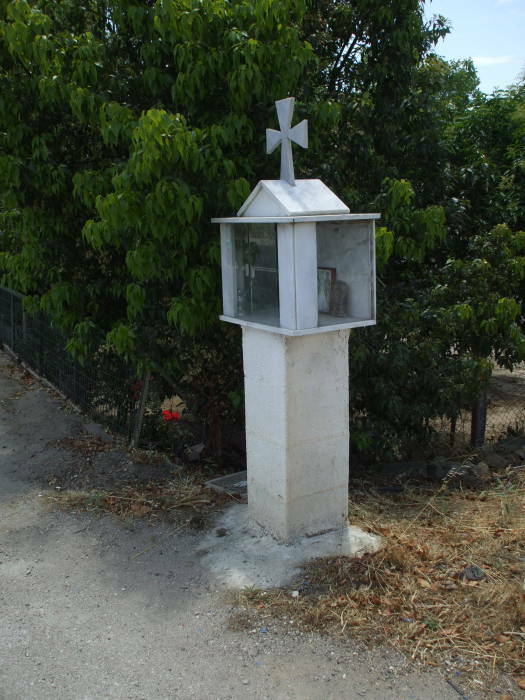 Another very distinctive thing you will see in Greece, at least on the mainland outside the major cities, is the roadside shrine. 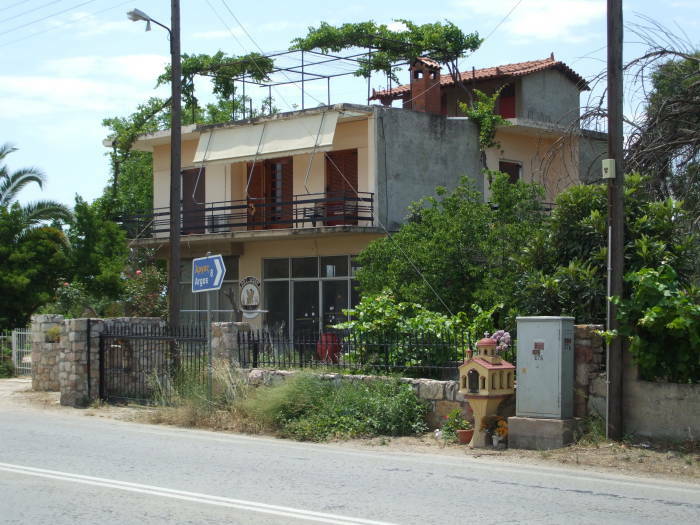 Some of them are quite simple, like this all metal one along the road between Nafplio and Tiryns. 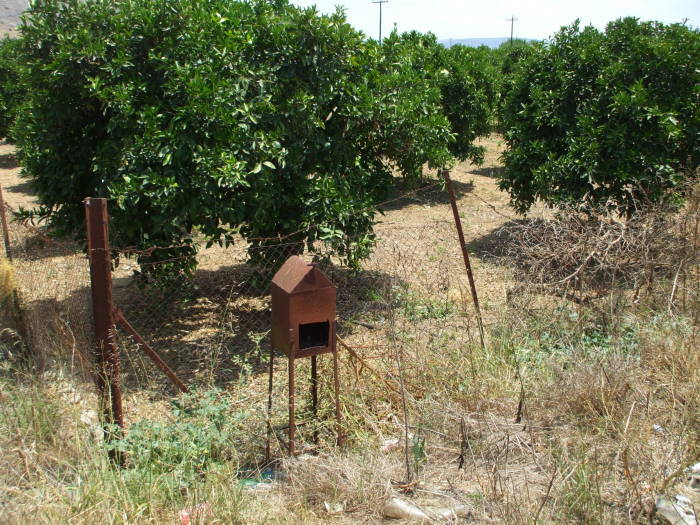 All metal shrine next to an orange orchard along the highway between Nafplio and Tiryns. At the opposite end of the spectrum are the ones like miniature churches on masonry columns, like this one outside Moni Agiou Nikolaou Anapafsa, a monastery at Meteora. 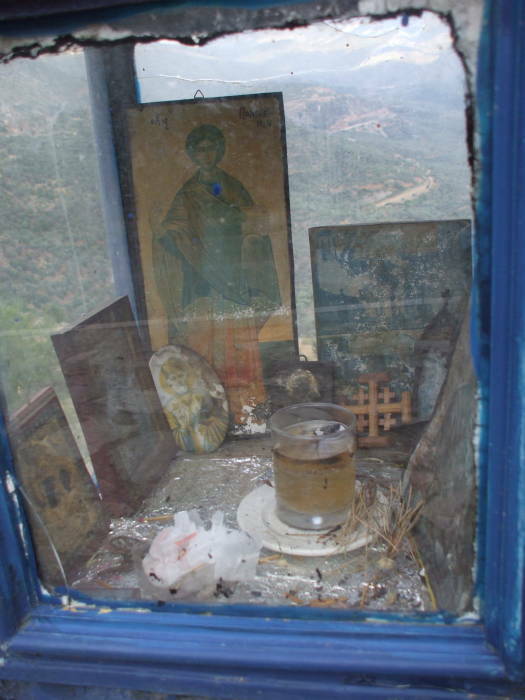 Elaborate shrine at Moni Agiou Nikolaou Anapafsa at Meteora. Well, it is a monastery, after all, and so we might expect a bit more here. But many privately owned shrines are at least as nice. 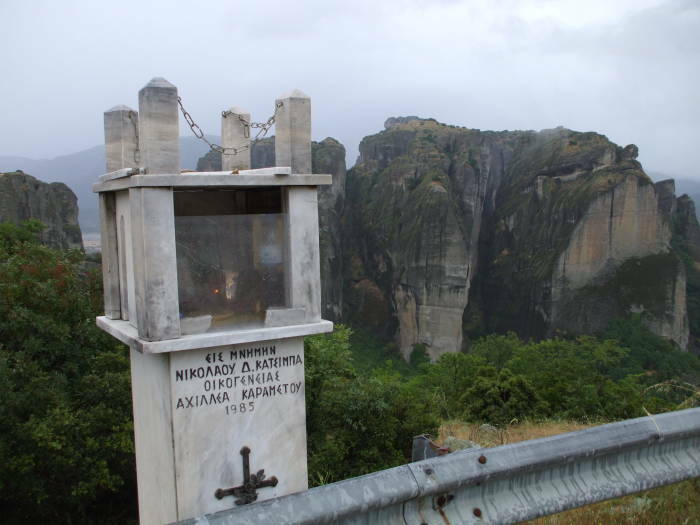 The one below is along a road joining the monasteries scattered across the sharp peaks of Meteora. The inscription reads: Εις Μνημην Νικολαου Δ. Κατσιμπα Οικογενειας Αχιλλεα Καραμετου 1985. Or, I think, Memorial to Nikolaou D. Katsimpas from the family of Achilles Karametou, 1985. Below you can see its contents. 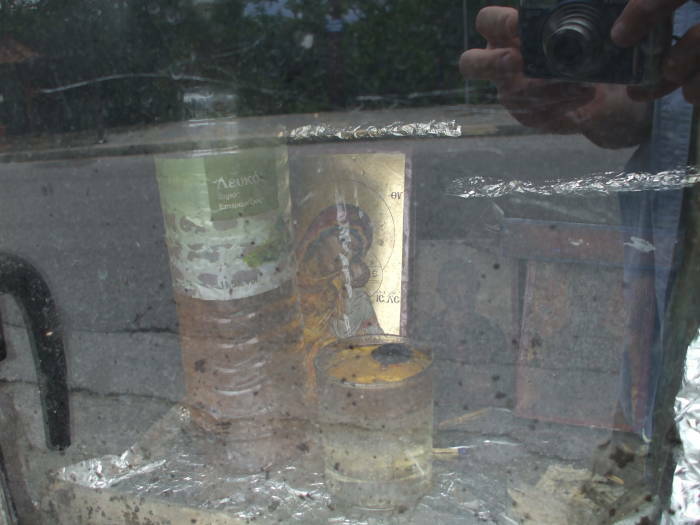 Several small icons, a small oil lamp, and a water bottle holding oil for the lamp. The lamp is burning, as they frequently are in roadside shrines. This means that someone has recently visited this shrine and tended the lamp. 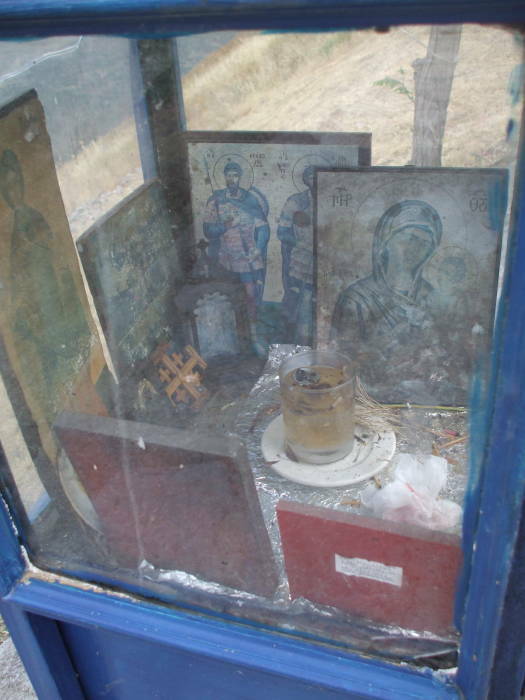 Shrine along the road joining the monasteries at Meteora. 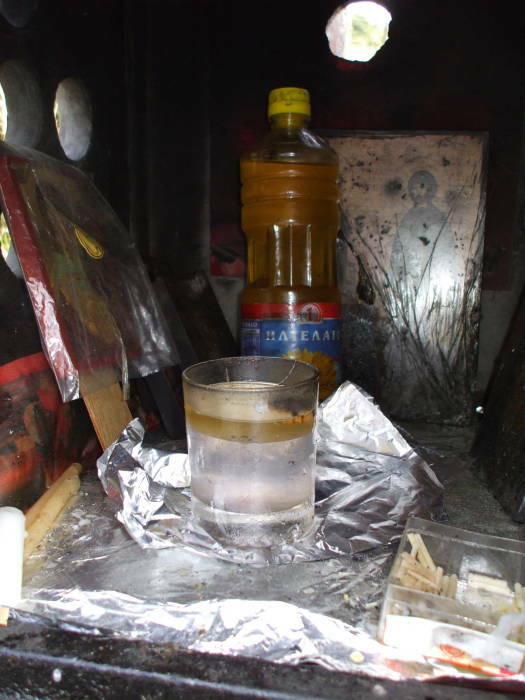 Interior, with water bottle holding oil, icons, and small lamp. 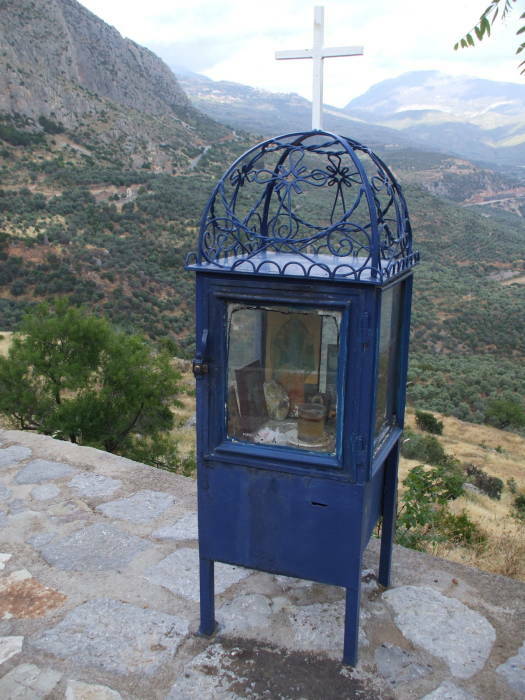 This relatively simple metal shrine is in Kastraki, the town below the pinnacles and monasteries of Meteora. 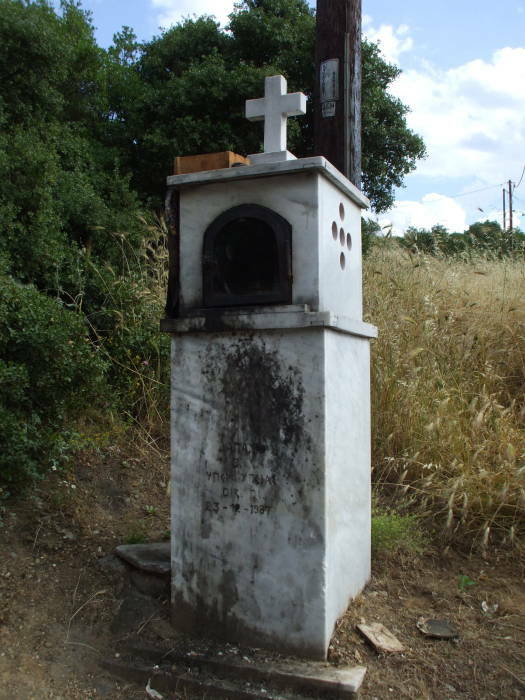 Simple metal shrine in Kastraki. 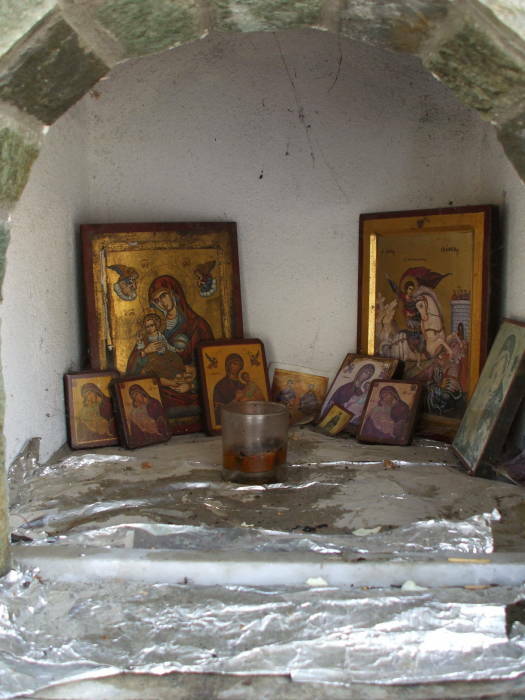 This much more elaborate shrine is also in Kastraki, below Meteora. It is really a small brick structure. 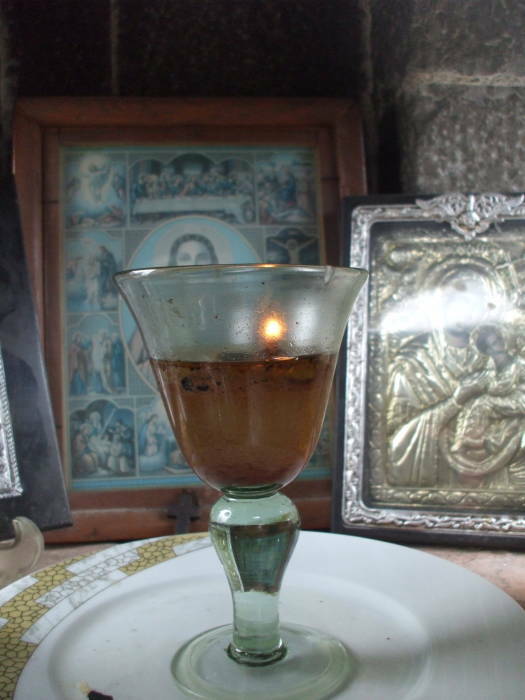 It holds several icons, and a candle instead of an oil lamp. 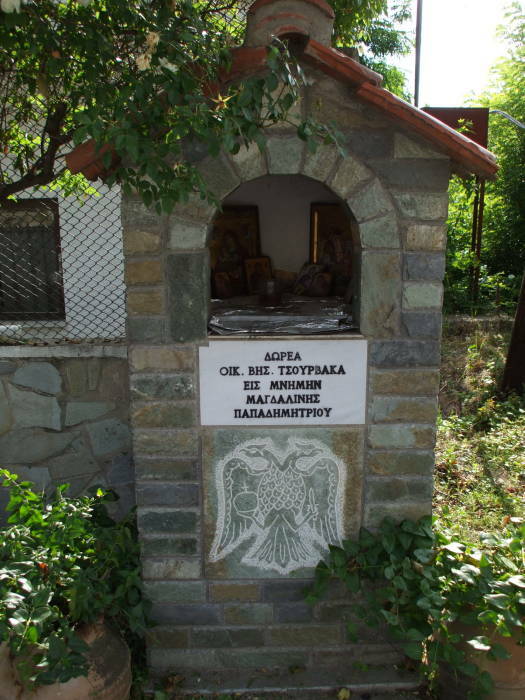 This shrine is along the road between Kastraki and Kalambaka, where you would arrive by train for a visit to Meteora. 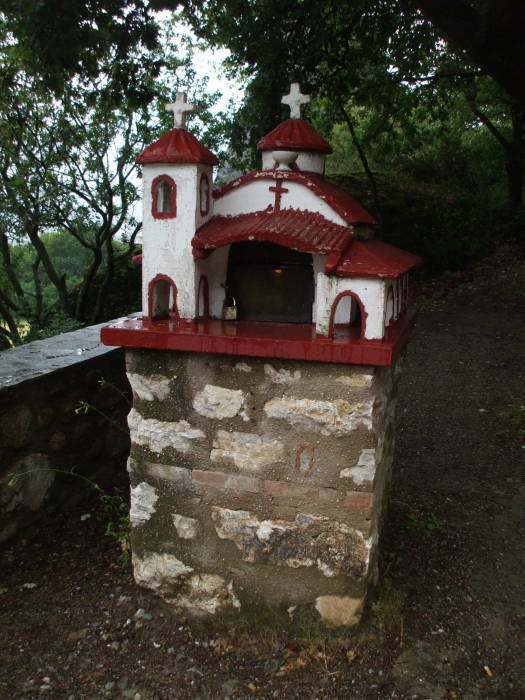 It's a walk of just a couple of kilometers from Kalambaka to Kastraki, up over this low hill and past this roadside shrine. 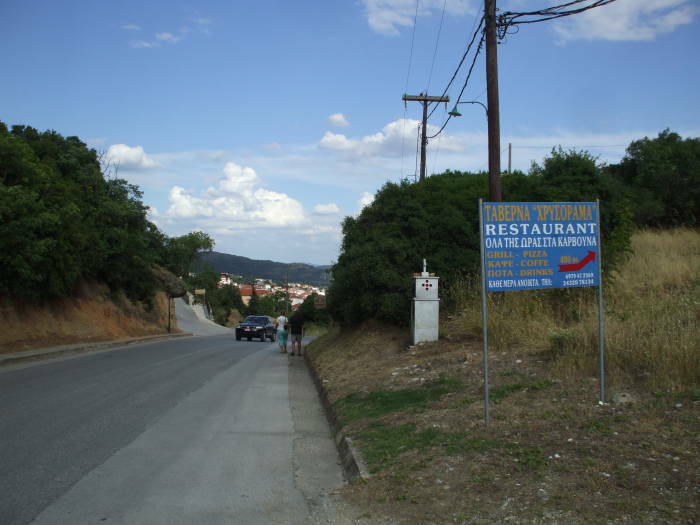 Along the road between Kastraki and Kalambaka. 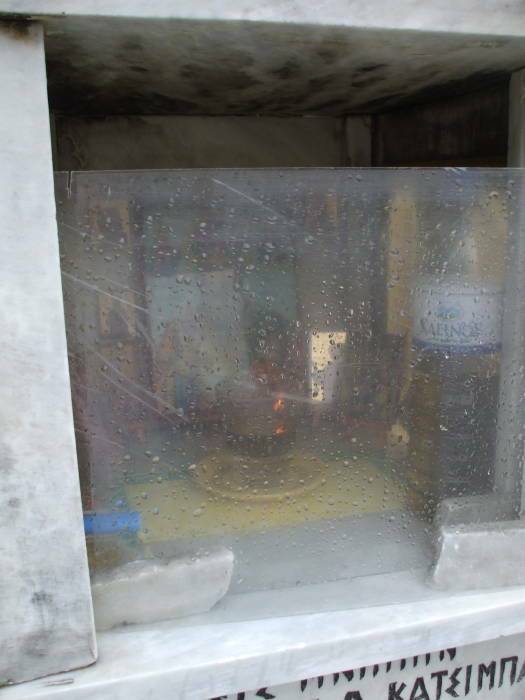 This shrine, with a lot of glass, is along the highway just outside the ancient sacred site of Delphi. Delphi or Δελφοί was a religious center from about 1600 BC until 395 AD. This stone shrine with a clay tile roof is in the town of Argos, in the Peloponnese, near the ancient sites of Tiryns and Mycenae. 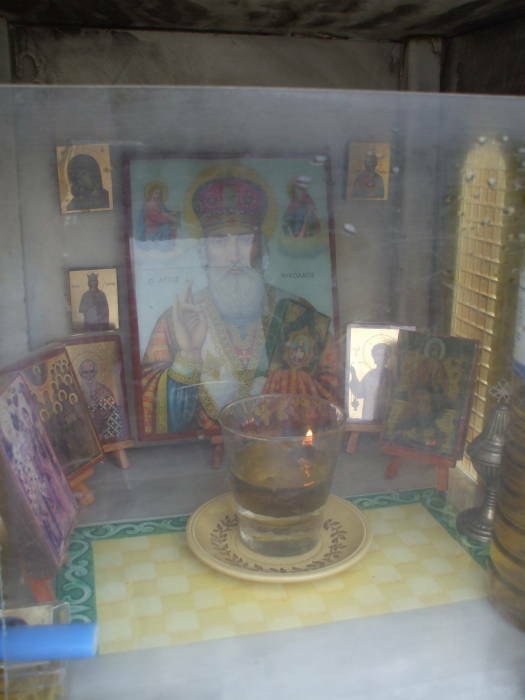 Dedicated to Agios Georgios, Saint George. 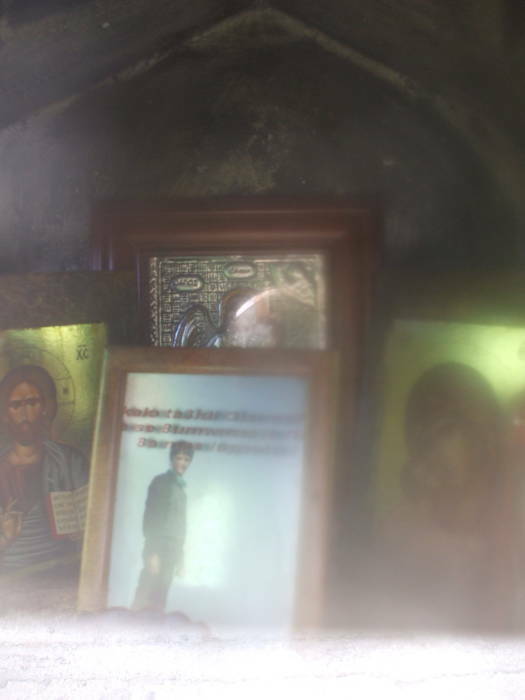 Interior: Oil, icons, and lamp. 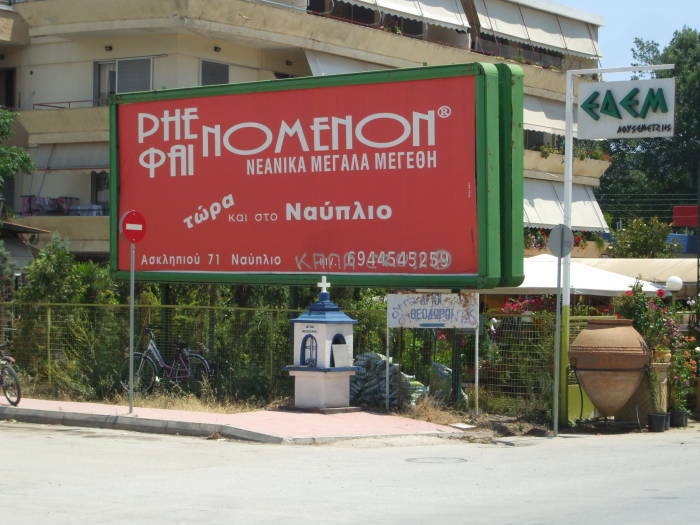 This handsome prefabricated shrine is along the highway between Nafplio and the ancient citadel of Tiryns. 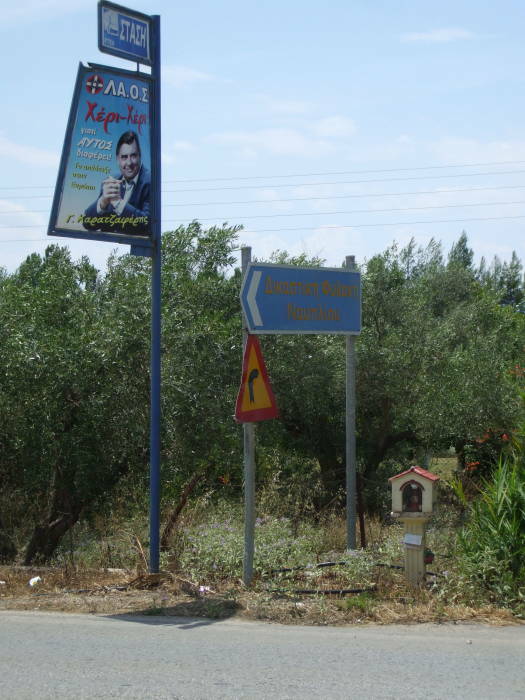 Along the highway between Nafplio and Tiryns. 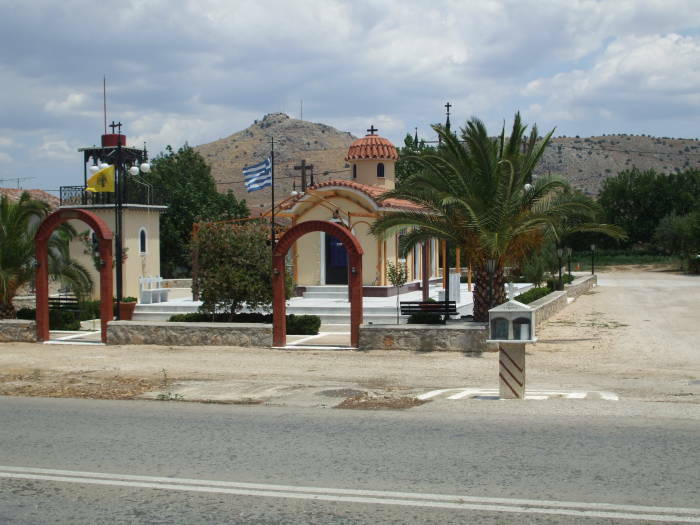 This chapel and shrine are also along the highway between Nafplio and Tiryns. I believe they are associated with the district police headquarters. 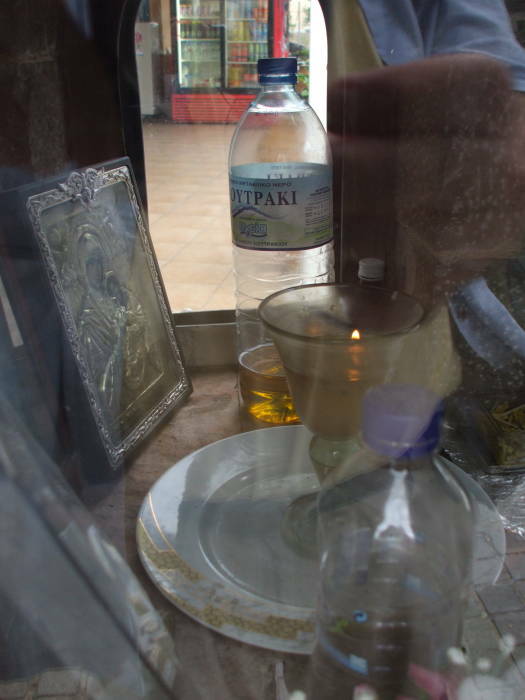 The shrine and chapel are dedicated to Αγια Ευφημια, Agia Efthimia. 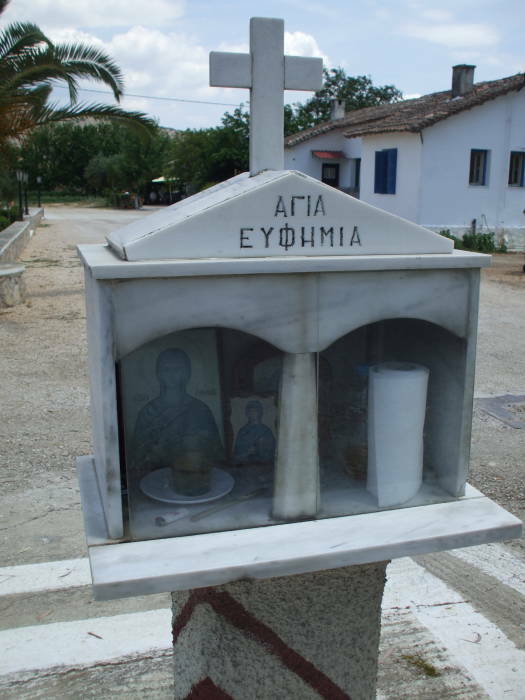 This shrine is just a hundred meters down the highway toward Nafplio. 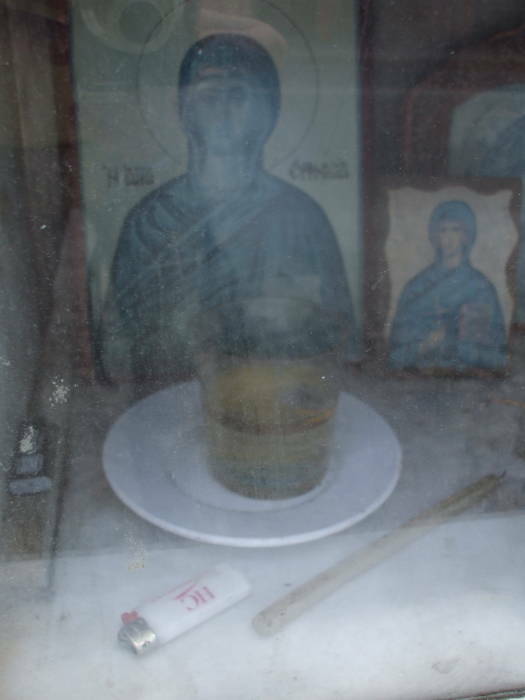 Interior: Icon, lamp, and candle. Across from the Nafplio jail. 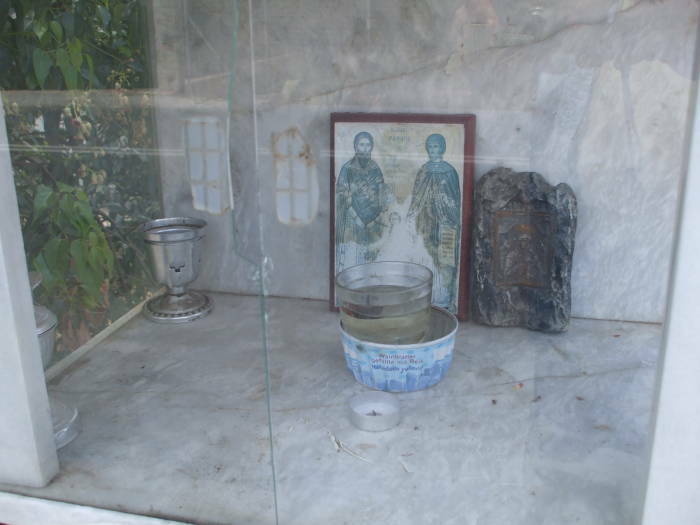 This shrine, at the intersection of a small road and the main highway, is right across from Nafplio's jail. 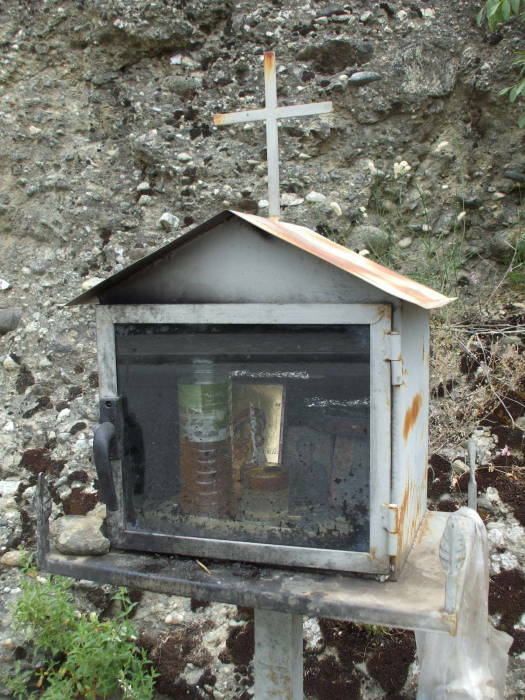 So by now you're wondering how you, too, might get your own roadside shrine. You could build one, but that might be complicated. Good news — You can simply go to a garden supply center and buy one! 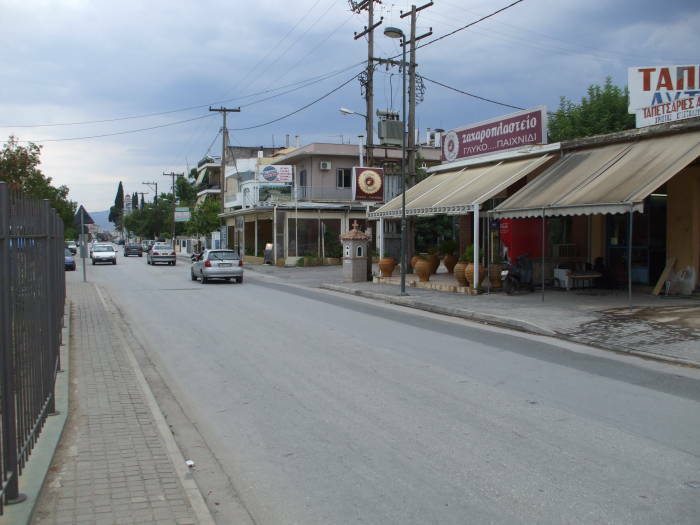 Here are some examples from a store along the road from Nafplio to Tiryns. Here they are, along with large flowerpots, fake wells, decorative columns, and potted plants. 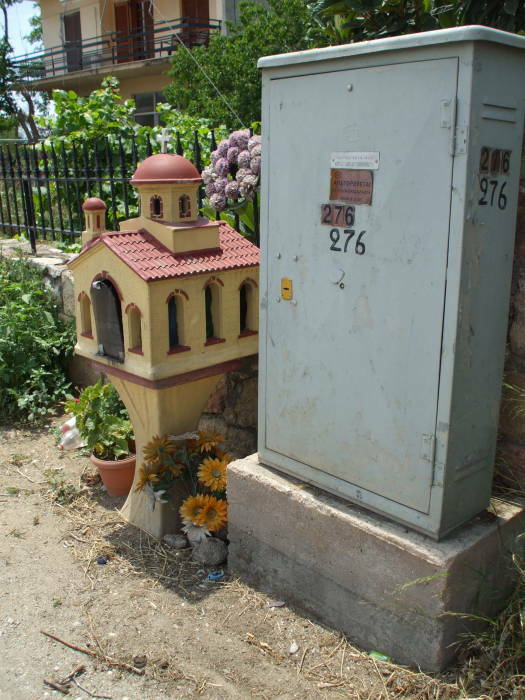 Shrine outside a garden supply center in Nafplio. 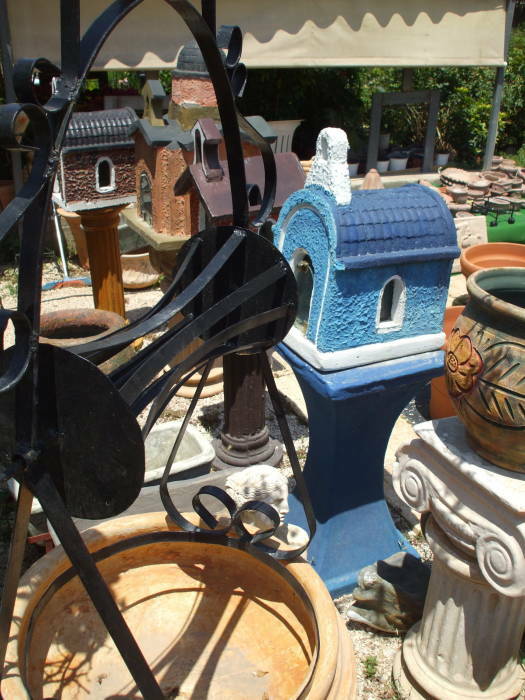 Shrines on sale at a garden supply center in Nafplio.